Houston, Texas, and the areas surrounding it have been devastated by the flooding brought to them by Hurricane Harvey. Hundreds of thousands have been displaced, and at least 10 have been confirmed dead. Neighbors and strangers have put their own safety and comfort at risk to help those in danger and in need. Two such heroes are father and son Chance and Rowdy Ward. These Texas cowboys have been showing the world what true heroism and selflessness look like as they have ridden around the area trying to save as many people, horses, and livestock as they can. Chance has posted several harrowing videos of their efforts on Facebook. The pair was out early in the morning, loading up their horses and driving to where these helpless animals were trapped. One video that has gone viral shows Rowdy roping a feisty stud colt who was trapped in his pen. 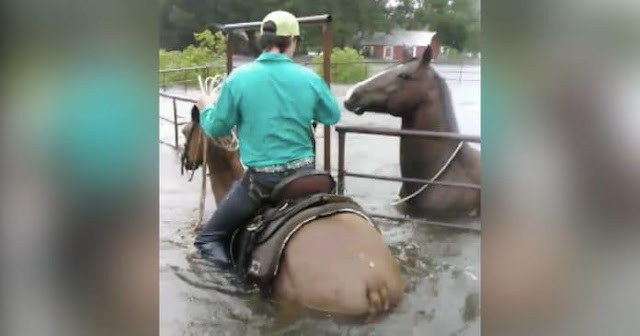 As Rowdy tried to keep his own horse calm, he used all his might to open up the gate to the pen, which had become stuck in the mud under the deep waters. Amazingly, according to the caption on the video, “All animals were saved.” The heroic pair’s work isn’t done yet, but they are already receiving praise from grateful animal lovers all around the world. For Stacy Reik, the Wards’ efforts haven’t just been a far off story to watch or read about – she has seen their incredible efforts firsthand. We are certainly grateful for heroic people like Chance and Rowdy who are going above and beyond to make sure not one person or animal is left behind in the flood, and we will continue to bring you more stories like this one as they come to light! Are you grateful for Chance and Rowdy’s heroic and selfless efforts? So share this!